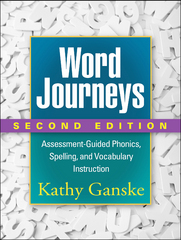 Word Journeys, Second Edition 2 Edition This trusted teacher resource and course text provides a comprehensive approach to assessing and building children's word knowledge (grades K-8) Kathy Ganske shows how carefully planned word study can improve students' reading and writing skills while fostering their appreciation of language. Complete instructions are provided for implementing the Developmental Spelling Analysis (DSA), an easy-to-use assessment tool, and for tailoring instruction to learners' strengths and weaknesses. Numerous word lists, student work samples, and "Literature Links" are included, along with 24 reproducible forms.The large-size format facilitates photocopying. Purchasers also get access to a Web page where they can download and print the reproducible materials. New to This Edition: *Addresses the Common Core State Standards. *Incorporates additional activities and technology tips, plus updated research findings. *Chapter explaining the meaning of word study and its role in literacy instruction, including "Researcher Voices" perspectives from noted experts. *Ideas for making the most of small-group instructional time. *Expanded "Literature Links" book lists, now including informational texts. *DSA answer sheets have been enhanced for easier scoring and several new reproducibles added See also the companion volumes from Ganske, Word Sorts and More: Sound, Pattern, and Meaning Explorations K-3 and Mindful of Words: Spelling and Vocabulary Explorations 4-8, which provide a wealth of ready-to-use word study activities.